Image from The Planning Notepad. We humans have an ability that goes well beyond what any other animal can do: we can turn our attention to ourselves. So far we have seen that humans are like other animals, but amplified significantly. We have greater intelligence and hence greater technology, greater culture, and greater ability to keep track of and get along with others of our species. We’ve seen how cognition and emotion work, and what intelligence consists of; and it is certainly plausible to think that other animals have rudimentary forms of the same. Our primate cousins, chimps and bonobos, resemble us in many ways. But we are more than just super-apes. We humans have an ability that goes well beyond what any other animal can do: we can turn our attention to ourselves. Even more than our vast intelligence, the capacity for self-reflection -- that we are able to turn our attention to our own experience, to take ourselves as an object of thought and perception -- is what makes us uniquely human. We have seen that humans have far greater intelligence than other animals, that we are the species that makes plans, that imagines states of affairs not immediately present, and targets our behavior to reach envisaged goals. When this intelligence is directed at affairs in the world, I call it first-order mentation. This can range from the very simple, such as jotting down a grocery list, to the very complex, such as planning a multi-year project encompassing thousands of interrelated tasks. Not only do we make plans, we execute them and accomplish our goals, making corrections along the way to overcome obstacles and take into account changing circumstances. When this kind of observation, planning, and execution is directed at ourselves, I call it second-order mentation. 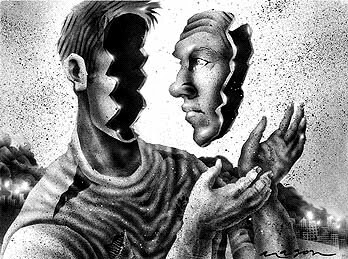 Others have called it self-consciousness, self-knowledge, or self-reflection (as one examines one’s reflected image in a mirror). By “mentation” I mean mental -- that is, private or subjective -- acts of all kinds: thought, imagination, desire, aversion, volition (planning and acting on your plans), direct perception, and so forth. Second-order mentation occurs when we direct these activities toward ourselves. This and previous blog posts are an example: human beings thinking about being human. Another example is self-knowledge, for example knowing your strengths and weaknesses. Another is paying attention to yourself, whether that be in the awkwardness of social embarrassment or in the focus of learning a new skill. Another is remembering how you interacted with others or mentally rehearsing how you will interact with them in the future. In these and many other ways we take ourselves as objects of our own cognition. These forms of self-reflection enable self-transcendence. By this I mean that in “seeing” ourselves as an object, we take a position, as it were, outside of ourselves, and that enables us to alter the self that is “seen.”(1) Of course the self that is “seen” is not different from the self that “sees,” in that both are the interior of the same physical body. But in another sense, the self that “sees” is different. It has a larger vantage point and is not caught up, or at least not entirely caught up, in the life of the self that is “seen.” By taking a position outside yourself, you can alter yourself. Harry Frankfurt describes this self-reflective structure of the self in his essay “Freedom of the Will.”(2) Humans, along with all other living beings, have first-order desires, desires to do or to have something. Some animals -- chimps and bonobos are good examples, and possibly dolphins and whales -- even appear to have the rudimentary ability to anticipate the future and make decisions based on prior thought. But only humans have “the capacity for reflective self-evaluation that is manifested in the formation of second-order desires,”(3) desires to have certain desires. The second-order self wants the first-order self to want something, typically something different from what the first-order self actually wants. For example, suppose you have a craving for a certain food -- something sweet and sugary, say, or full of fat and salt -- that tastes good but is not healthy. Realizing that, you may feel bad about the craving and want to want something else to eat. That is a second-order desire. An even stronger form is second order volition, where you want a certain desire to be your will. By will Frankfurt means a desire that is strong enough to move you to action. (4) In this example, you would not only want to eat something healthy and want not to want the unhealthy food, but would also want the desire to eat healthily to overrule the craving, to be the desire that actually results in action so that you end up eating the healthy food. Having a free will in this sense is an example of our second-order mentation functioning well. Like any human activity, second-order mentation can be done poorly or skillfully. When we are unable to see the whole picture, when we have false ideas about ourselves, distorted by ignorance or painful emotion, we are doing it poorly. When we are able to observe ourselves carefully over time, identifying and removing preconceptions, we are doing it better. When we have true ideas about ourselves but are unable to act on them, we are doing it poorly. (This is Frankfurt’s unfree will.) When we are able to use what we find out about ourselves to change for the better how we behave and hence what kind of person we become, we are doing it excellently. Our capacity for second-order mentation is subject to excess and deficiency. It is excessive when we are too embarrassed to function well socially or too self-conscious to be able to, for instance, swing a golf club properly or do some other task that takes physical skill. It is deficient when we fail to learn from experience. It is deficient when we lose ourselves in what Heidegger calls “the publicness of the ‘they,’”(8) when we just go along with the crowd without thinking about what we are doing. It is deficient in quite a brutal way when we see that we are caught in a repetitive and painful pattern of behavior but lack the skill to get out of it. But we always have the possibility of doing better. A failure of second-order mentation is a case of failure of intelligence generally, and there are ways to overcome such failures. That, however, is a topic for another time. What I am suggesting is this: Second-order mentation is the peculiarly human virtue, what we do that other beings don’t. We are all capable of it, and when we do it well we function optimally and are most fulfilled. It is what enables us to achieve the goals we set for ourselves. Second-order mentation gives us mastery, because it enables us to tune the instrument, so to speak, by means of which we exert first-order influence on the world. Second-order mentation gives us the peculiar sense of self that is expressed in the poem Invictus: “I am the master of my fate: / I am the captain of my soul.”(9) The I to which the poet refers is the coherence of interiority of second-order mentation, the ongoing inner life of how it feels to be operating at that second-order level. We each (unless we are damaged) have a first-order sense of ourselves as continuous and ongoing entities, as being the same person through time, which comes from familiarity with a point of view, from being within that point of view and seeing the world from it. Within our interior landscape, so to speak, there are certain familiar features -- habitual thoughts, feelings, emotions, attitudes, and ways of behaving -- that are present all or most of the time. These comprise a sense of how it feels to be oneself. Much of the self-sense no doubt comes from the experience of being in our body, a particular body that has a particular vantage point on the world. The body changes over time, but gradually enough that we have a sense of continuity. The sense of self is the unity over time of interior background feeling tone; and the sense of self arising from second-order mentation is the same, except it seems more vivid, somehow more real or efficacious. That is because it is more efficacious: you exert control not only over your world but over yourself as well. And the point of philosophical inquiry to be able to do exactly that: command yourself so as to live well. (1) “See” and its variants are in quotes because the experience is not entirely and not merely visual. We experience ourselves in many modalities. (2) Frankfurt, The Importance of What We Care About, pp. 11-25. (6) The distinction between “human” and “person” is just terminological at this point, but if we discover that some non-humans -- whales, say, or beings from another planet -- have the same capacity for second-order mentation that we do, then, with Frankfurt, we should speak of persons rather than humans. (7) Frankfurt, The Importance of What We Care About, pp. 20-21. (8) Heidegger, Being and Time, p. 220. Heidegger, Martin. Being and Time. Tr. Macquarrie, John, and Robinson, Edward. New York: Harper and Row HarperSanFrancisco, 1962.
Henley, William Ernest. Invictus. Available online, URL = http://www.bartleby.com/103/7.html as of 12 March 2010.